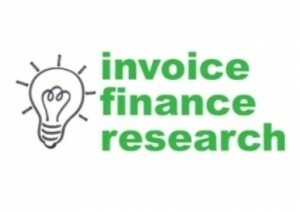 Before you go ahead with an invoice discounting facility you may want to read our summary of how prices and funding levels compare between different invoice discounting companies. 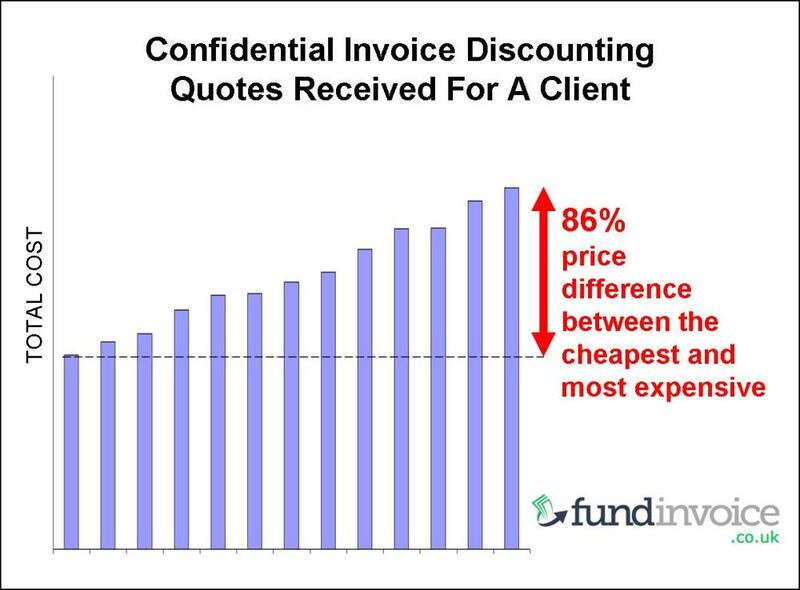 We conducted this comparison by seeking quotes for a client, from a number of different providers that offer these types of invoice discounting facilities. 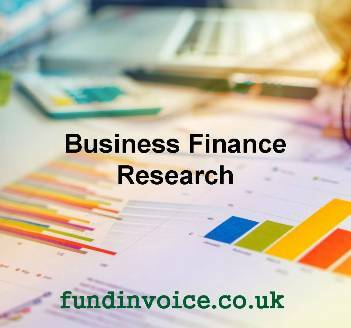 The client was of an average size and within a standard sector where use of invoice funding is common practice. Below we summarise how various aspects of the facilities that were quoted compare. By overall pricing we mean the combination of the "administration fee or charge" and the "discount charge". Both were calculated by taking the quote provided, and using anticipated figures for projected turnover and funds in use to calculate the likely level of the charges. For the purpose of making this comparison, we did not include other charges e.g. for CHAPs transfers, should they be required. We found that the range in overall pricing varied by 86% from the cheapest quote to the most expensive. That means that if the client choose the most expensive provider, they could pay 86% more each year, than if they selected the cheapest. We then looked specifically at some components of the overall charge - administration fees (or charges), discount fees (or charges) and an minimum fees. We found the greatest variation between providers in the admin fee. 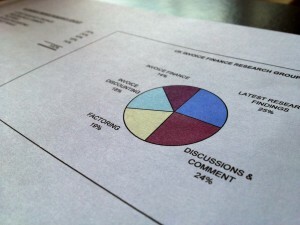 There was a range of 150% between the cheapest and most expensive quotes received. That means that by selecting the most expensive provider, you would pay 1.5 times more than by selecting the cheapest. It is also worth knowing that the admin charge only accounts for 59%, on average, of the overall pricing (excluding any additional charges), so you should not consider it alone when comparing quotations. The impact of the different approaches to the minimum monthly fee was unexpected. There was a minimum quoted in all cases, but in a few examples it actually exceeded the amount that would have been charged by way of the admin fee that was quoted. This means that it would have been guaranteed to bite, increasing the monthly charge in those cases. Where the minimum quoted exceeded the admin fee percentage, the range by which it exceeded the admin fee was between 105% and 111%. So again by selecting the wrong provider you could pay 11% more than the admin fee percentage that was quoted, due to the minimum monthly fee. Where the minimum monthly fee did not exceed the percentage, the average level it was set at was 86% of the anticipated admin fee. However, the range was between 60% and 94% of the anticipated admin fee, with the higher level giving very little margin by which to miss your turnover target. Looking specifically at the discount charge element, we found that 15% of providers quoted over LIBOR, with the rest quoting over bank base rate of some description. When we looked at the margin they quoted above that base, there was a 75% difference between the top and bottom of the pricing table. So the range was less volatile than for the admin fee element, but there were still very significant differences. We also considered funding levels to see how they compared. We looked at the differences between the headline prepayment percentages that were volunteered by the providers that quoted. In about a third of cases, 90% was the opening rate quoted, with the remaining two thirds quoting 85% prepayments against invoices. The facility limits quoted were also interesting. In all cases the facility limit quoted (the maximum amount of funding that can be drawn down) exceeded the level of funding we were projecting for the client. The highest limit quoted was 1.7 times the anticipated funds in use, and the lowest was just 1.14 times the anticipated funds in use - the lower limit leaving a very narrow margin for growth before you would need to renegotiate (and potentially incur a fee to review the limit). No minimum discount charges were quoted, although we have heard of this practice being implemented by at least one provider within the market. So overall there were some very significant swings in both pricing and funding levels that were offered. By selecting the wrong provider, you could end up paying 86% more than you need to, and you could lose out on an additional 5% prepayment against your invoices. Equally, a low facility limit could leave you needed to renegotiate, and potentially incur a review fee, after just 14% growth in your funds in use.